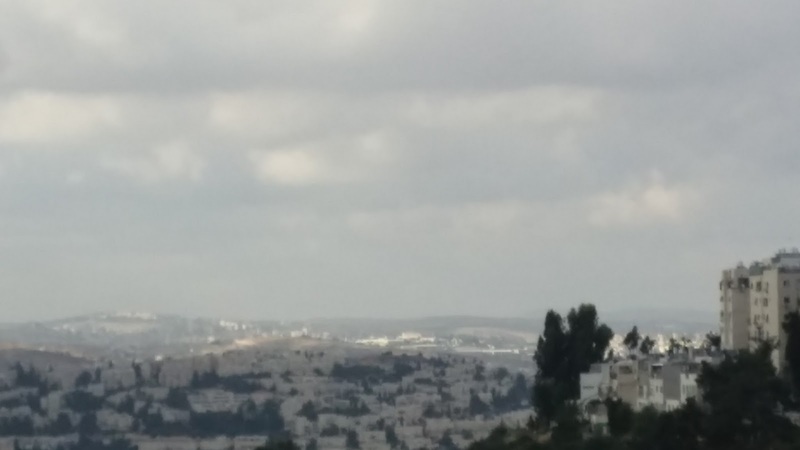 Once again, Tamar Ansh and Esther Heller put together a packed day for the Jerusalem Women Writers' Seminar. 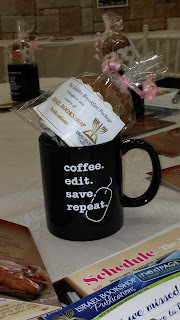 Again, a beautiful relaxation corner sponsored by Menucha Publishers with those delicious little bite-sized pastries and an assortment of teas and coffee. Again, some nice swag from Israel Bookshop. What is amazing is that the program was filled with lively speakers and interesting information and very different from last year. After a Dvar Torah by Esther Leah Avner, an "experienced" author and educator, Shifrah Devorah Witt talked about "Making the Most Out of Your Writing Time!" Her suggestions are applicable to anyone who works at home: focus - no laundry, no checking Facebook (and then wasting an hour), setting boundaries with family. Next were Yael Mermelstein, Sarah Shapiro and Shoshana Schwartz. While Yael suggested adding tags and beats, Shoshana suggested getting rid of the tags and the beats. Sarah Shapiro asked "Is There Such a Thing as Non-fiction?" Three different authors, three different styles, three different processes. My favorite speaker of the day was Sherri Mandell, author of The Blessing of a Broken Heart, a 2004 National Jewish Book Award Winner. After reading this one, I felt like I knew her because she shared her most intimate thoughts and feelings after the murder of her son Koby and his friend Yosef Ish-Ran in 2001. Sherri discussed her new book The Road to Resilience (Toby Press, 2016) and how to apply the "Seven C's" to keep writing well. A witty and engaging speaker, she described the "pavement" of Chase, Community, Choice, Creativity, Commemoration, Consecration, and Celebration. These are all augmented by Curiosity. Through these steps, almost any journey, especially grief and writing, can become almost spiritual and expand you. There was a Meet the Press Panel with questions and answers for those interested in submitting their work to the weekly Jewish magazines and newspapers. For those who could not be there in person, these sessions were videotaped and are available (for a fee) through Torah Anytime. Chana Levitan spoke about how she "accidentally wrote a best-selling book" (I Only Want to Get Married Once, Gefen (2010) and Grand Central Life and Style (2013)). Over lunch, I got to talk with some of the "celebrities" of Orthodox Publishing: Yaffa Ganz, Libi Astaire and Chaya Baila Lieber. 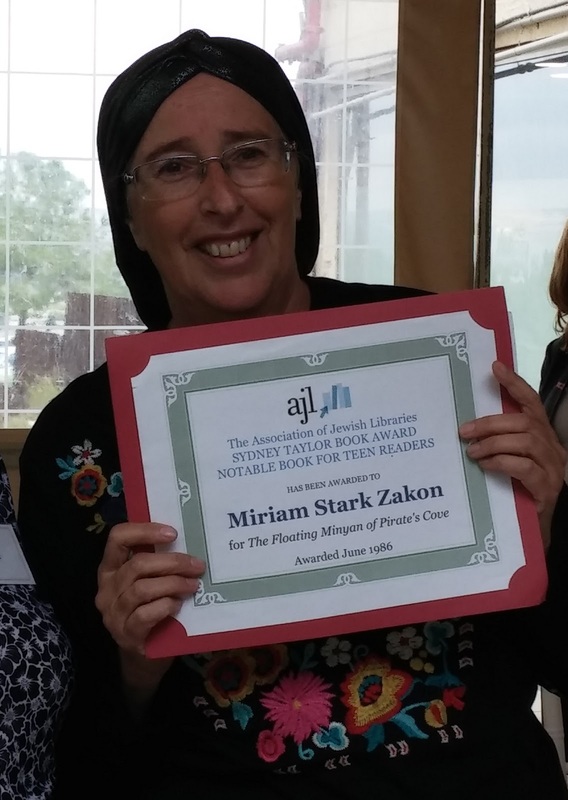 I also had the pleasure of presenting Miriam Zakon with a certificate for her Sydney Taylor Notable Book, Floating Minyan of Pirates' Cove (Judaica Press, 1986). Yes, the book was recognized 30 years ago, but there was no internet and no cell phones, so Miriam was never notified about the honor. Our little ceremony also gave me a chance to look at Miriam Stark Zakon's extensive back list of books authored and/or edited. I'm hoping to be able to present some more certificates to Miriam (and Yaffa, Libi and Chaya Baila) in the next 30 years! Between the topics and presenters it was hard to choose which workshops to attend. I learned a lot in Avigail Sharer's "Step Back in Time: How to Bring the Past to Life in Your Fiction." Sharer writes under the pen name Leah Gebber, and has many fans due to her articles and stories that are published in Mispacha Magazine - particularly Sisters Under Siege. Sharer handed out pictures of artifacts - coins, articles of clothing, etc., and asked the participants to think of five questions about the item. Then, we were asked to take one question and try to answer it. Much like "Ode to a Grecian Urn," a whole story can develop by looking at an object. I picked up a very important book -- Healing from the Break (Menucha Publishers, 2016). While there are many volumes in your local Jewish bookstore about trying to repair a relationship or the laws (halacha) of divorce, there is nothing available that provides "stories, inspiration and guidance for anyone touched by divorce." Insightful and sensitive, the book looks at a challenging situation from many perspectives. 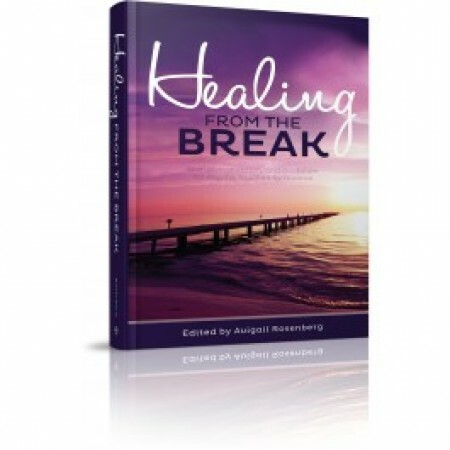 Healing from the Break is the "frum divorce blog" and includes articles and resources. As I left the seminar, I was blessed with that beautiful interplay of sun and clouds that seems to make Jerusalem glow.